We’re jet setting up and down the west coast with @alaskaair for our Awesome with Alison SUPER DUPER FLY live podcast tour…and we need YOU there! We’ll be shimmying on into Seattle for our final show on November 15th! Join us…Alison and Eric…and our special guest Andrea Faulkner Williams (Alison’s sister!!!) of Tubby Todd for fun, goodies and gratitude–AND no sister squabbles–we swear! Whether you have listened to the Awesome with Alison podcast or not, our live show is for you if: 1. You like having fun 2. You want ideas and inspiration for getting clearer about the direction of your life! It will be an interactive, intimate, treat-filled ride–so put those tray tables up! We are so stoked to soar, cruise, and feel awesome with you! Space is limited and the ticket price decreases when you bring your friends, so do us ALL a favor–grab a buddy (new or old! )–and SHOW UP and party with us! We can’t wait to boogie with you! BOARDING DETAILS: This show is for passengers ages 14+! Please be advised the only social lubricant we provide is caffeine, sugar and Alison’s intoxicating thrusts! Start-time: Check in, pre-flight fun and goodies begin at 7pm! The show starts at 8pm SHARP–we will take off without you so don’t be late! 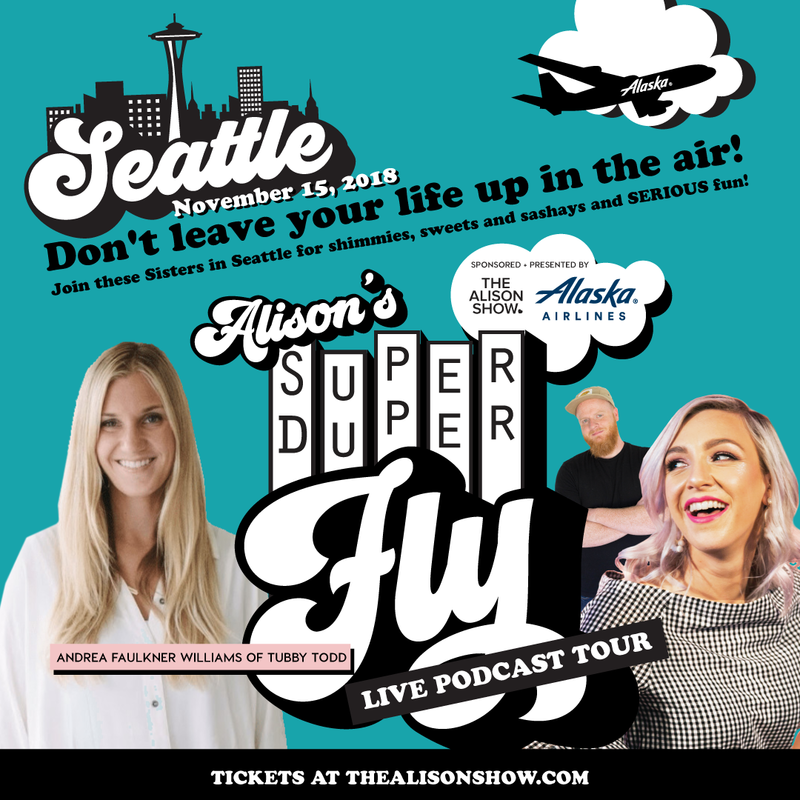 We’re jet setting up and down the west coast with @alaskaairlines for our Awesome with Alison SUPER DUPER FLY live podcast tour…and we need YOU there! Are you ready for your awesome to take off?! You know Eric and I are! Tickets are now LIVE and I’m FREAKING OUT–it’s going to be so good! Whether you have listened to the podcast or not, our live show is for you if you: 1. Like having fun 2. Want ideas and inspiration for getting clearer about the direction of your life! It will be an interactive, intimate, treat-filled ride–so put those tray tables up! You’ll check your emotional baggage at the door, and each show in each city will include INSANELY awesome special guests that will take part in an open Q&A session and help us learn about mapping out an awesome life!